The world now has a chance to see the rarest of Sikh relics, including the hair strands of Guru Gobind Singh, tenth and last of Sikh gurus. Hidden for ages from the public eye and denied to scholars, over 150 precious relics of the religion have been brought out of private collections for the first time to be documented. The treasure-trove of relics, woven together by one of their custodians Sikandar Singh and author Roopinder Singh, was dedicated to the people at a quiet function here this evening. 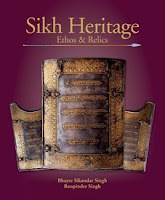 PM Manmohan Singh’s wife Gursharan Kaur launched the 204-page “Sikh Heritage: Ethos and Relics” published by Rupa. Gursharan took the occasion to remind the Sikhs of their dying mother tongue Punjabi. Eminent art historian Dr BN Goswamy and Gurinder Singh Mann, professor of religion at the University of California, nodded. The work introduces a repository of Sikh heritage. The collections are not simply manuscripts; these include objects used by the gurus, including the comb of Guru Gobind Singh. Also adorning the trove is a rare walnut wood “chariot” gifted to the fifth Sikh guru by a Muslim carpenter from Kashmir. “The rath was gifted to the fifth Guru Arjan Dev and was passed down to generations of his disciples. We have placed the chariot in its historical perspective. It was used to bring home the guru’s bride,” Sikandar Singh told The Tribune. 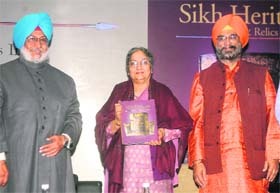 Gursharan Kaur, wife of PM Manmohan Singh, releases a book ‘Sikh Heritage: Ethos & Relics’ by Sikandar Singh (L) and Roopinder Singh (R) in New Delhi on Monday. Each work documented in the book bears a historical context. The story of Guru Gobind Singh’s hair strands and the comb is traced back to his disciple Syed Pathan, who helped him in a war. About the historical importance of the book, Roopinder Singh, co-author and senior journalist with The Tribune, said, “We have been able to showcase these relics in this manner for the first time. By placing them in historical perspective, we have conveyed that the whole is far greater than the sum of its parts. The work would be of great importance to the Sikh diaspora. It germinated from an exhibition of Sikh works which the Smithsonian Institute hosted in the US.” The work took the authors five years. Present also at the launch were Prof Upinder Singh, Prime Minister’s daughter and professor of history at University of Delhi; and her husband Vijay Tankha, Prof of philosophy at St Stephen’s; former editors of the Tribune HK Dua and Hari Jaisingh; former director of PGI Chandigarh JS Neki; National Commission for Minority Educational Institutions member Mohinder Singh, Punjabi Akademi vice-chairman Anita Singh and famous hotelier Bhai Balbir Singh.